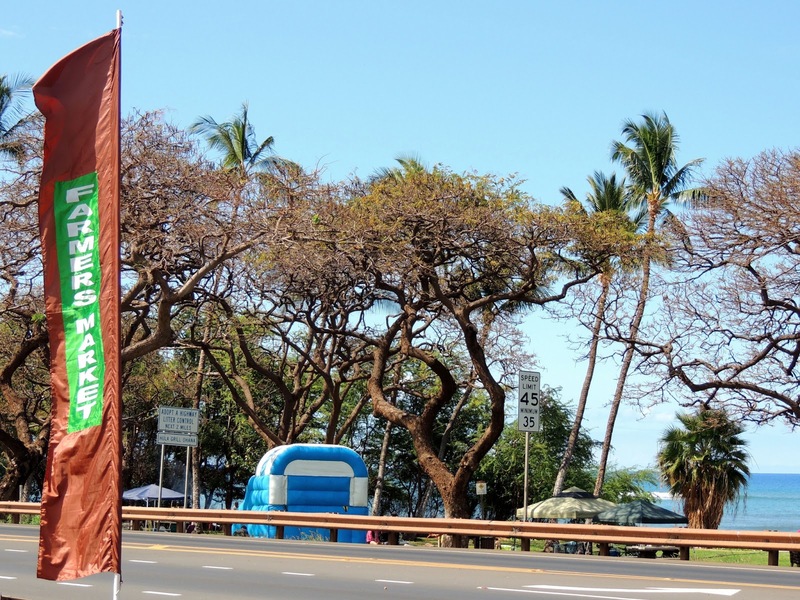 Sometimes on vacation there's nothing better than eating local food from a farmer's market. We stopped by a farmer's market on our way back to our hotel after a helicopter tour on Saturday, and we bought something from almost every stand. We bought a coconut. 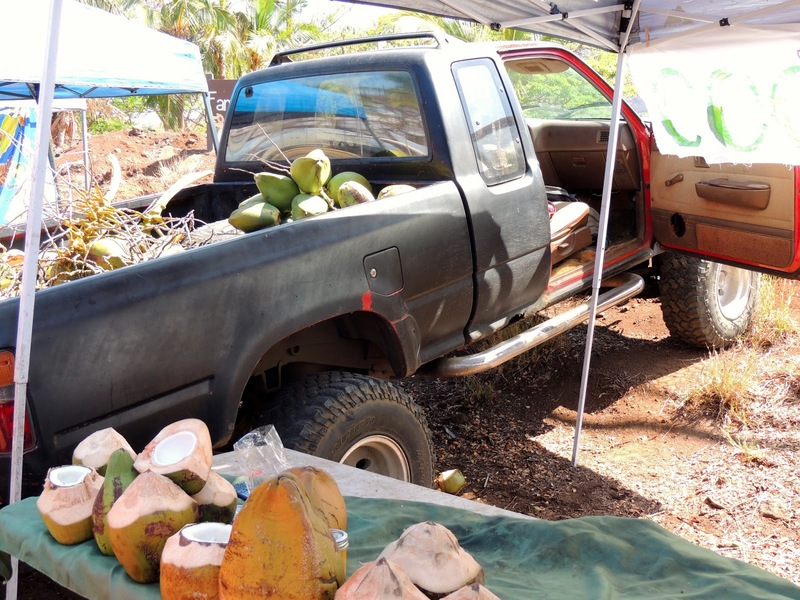 The guy selling them actually climbs the trees, pulls down the coconuts and loads them on his truck. 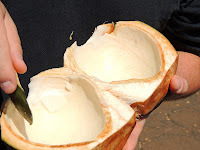 He poked a hole in it so we could drink out of it, and when we were done, he chopped it in half so we could eat out the insides. Now that's not something you get to do in L.A.
We bought some banana bread and lilikoi butter from another stand. 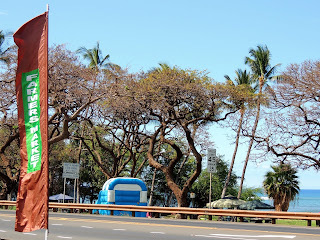 "Lilikoi" is the Hawaiian word for passion fruit. The butter and bread were truly delicious together. 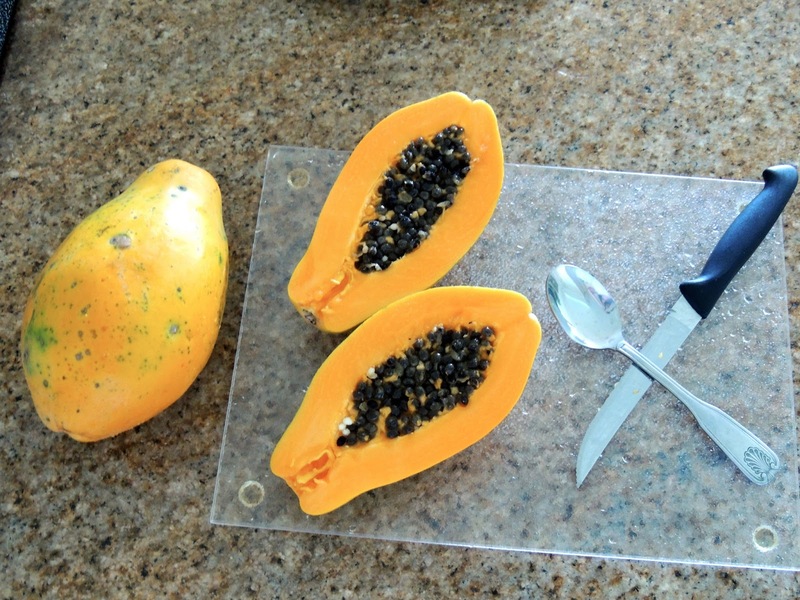 We bought papaya from another stand. We didn't know how to know if it's ripe, but the guy at the stand helped us pick them out. They're yellow when they're ripe. He gave us a yellow one to eat that day and one with a little green on it to eat the next day. 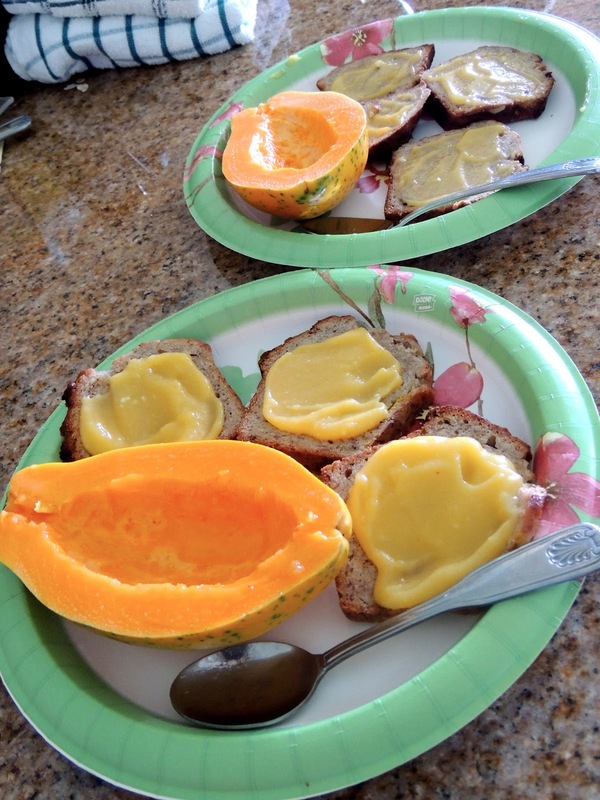 Papaya is my new favorite fruit. It kinda tastes like mango, but it's way easier to eat. 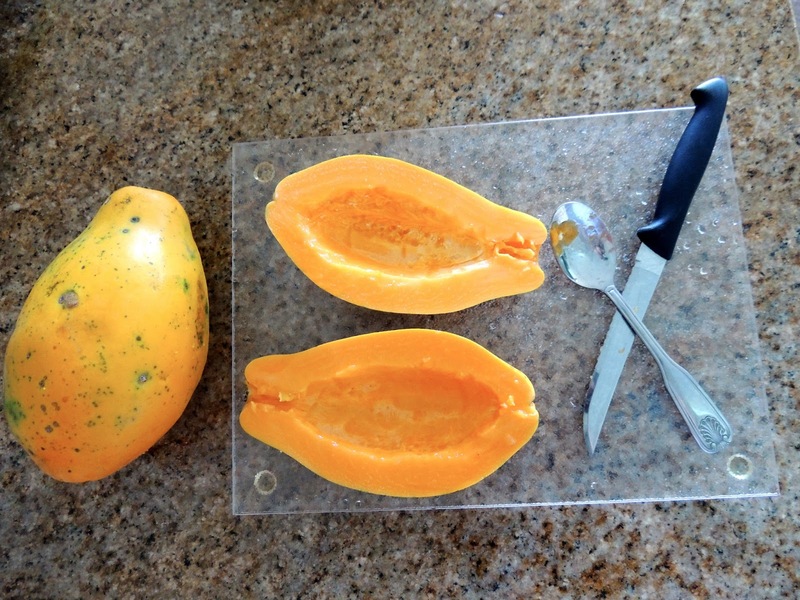 You can just cut it in half, scoop our the seeds and eat the insides out with a spoon. Yum! 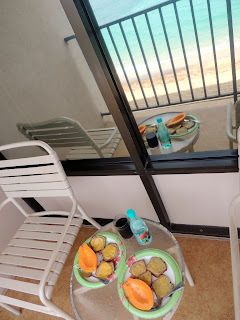 Back at our hotel room we had an amazing breakfast with an ocean view. 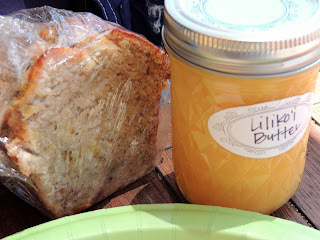 The sliced banana bread with the lilikoi butter was amazing. If we can bring the butter on the plane without it spoiling, I'd love to bring some home. 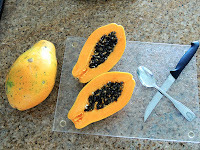 The papaya was a little bitter (maybe not quite ripe enough), but with a sprinkling of Splenda, I could eat it all day.